Rin Okumura bears the curse of being Satan's illegitimate son. He decides to hide his origins and enrolls at the Exorcism Cram School, a training institute for exorcists located on the True Cross Academy grounds. During an attack by Amaimon, the King of Earth, his identity as the Son of Satan is revealed. His friends are terrified and start to distance themselves. Then someone steals the Left Eye of the Impure King that had been sealed away in the deepest part of the academy. Rin and the others find themselves in an unexpected crisis. Blue Exorcist (Japanese: 青の祓魔師エクソシスト Hepburn: Ao no Ekusoshisuto) is a Japanese manga series written and illustrated by Kazue Katō. The story events which take place in the second season correspond to volumes 5 through 9 of the manga. 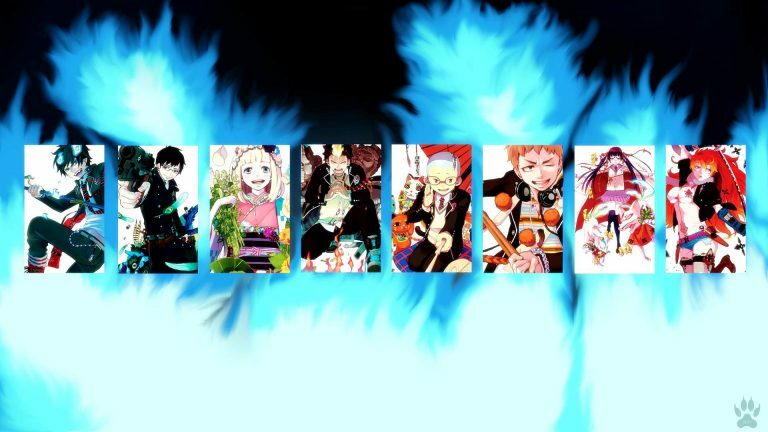 Blue Exorcist: Kyoto Saga pick right up after episode 15 from the first season. Episodes 16-25 from season one was completely ret-con and ignored. This season deal with the Kyoto Impure King arc. The animation is beautiful, just like the first season. Perhaps more green as it takes place in a lot of forest backdrop. The opening and closing themes are “Itteki no Eikyō” (一滴の影響; Drop’s Influence) by UVERworld and “Kono Te de” (コノ手デ; With This Hand) by Rin Akatsuki, respectively. Both are good songs, but I still like the first season-opening song “Core Pride” by Uverworld the best. Blue Exorcist continue to do what it does best, which is character development. We see Rin struggle to control his power while trying to mend the rift with his friends, due to being the son of Satan. We also see the other teammate struggle with their inner feeling of how they should treat the son of Satan. Despite all these characters’ growth moments, the anime pacing is fast and I wasn’t bored. These characters could easily be annoying under certain circumstance, but I find I like all of them. The only flaw I can think of for this season is one of the main villains constantly flaunt and taunt while he fights, instead of just finishing off his opponent. This seems out of place as most characters in Blue Exorcist are well developed. This either is intentional as the villain goal is something we don’t understand yet, or he’s just a poorly written villain. I highly recommend Blue Exorcist as the characters, story, and animation are all top notch. Let just hope we don’t have to wait another 6 years before season three. This anime contains graphic violence and mild suggestive themes/dialogs. Intended for young adults.